Looking for a way to have some drinks while giving back to a great cause? 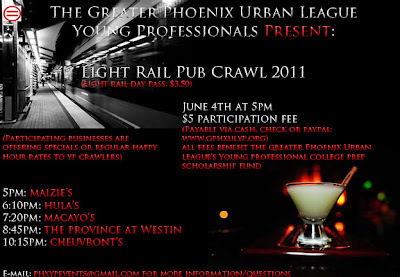 Join the Greater Phoenix Urban League Young Professionals for their Light Rail Pub Crawl 2011. The festivities will kick off tomorrow at 5pm @ Maizie's Cafe & Bistro (4750 N. Central Ave) and hit light rail hot spots Hula's Modern Tiki, Macayo's, The Province at Westin, and Cheuvront Restaurant & Wine Bar. Attendees will receive food and drink specials at each location and all proceeds with benefit the Urban League's College Prep Program. Tickets are only $5 and can be purchased online or at the event.